example, to get 80% power Id switch it on for 0.8s then off for 0.2s. relays, which would probably wear out quite quickly. kindly designed a circuit for me, and built a power control device. me USB control over the power level. I wrote a little python app to control the whole thing. now (Im running Ubuntu Karmic). power control and the link to the DMM. build, and the coffee tastes great! and seeing the nice CS Java RoastMonitor app. Bloody Ripper.. *I would suggest you follow up with SiliconChip as I would like to see you get some brownie points for the effort you and ya mates have put into it.. In particular... If the unit is made with the option of other uses.. Does Andy have a new version of his roast software in the pipeline, which may include control options? he does have something in the pipline, he illuded to it in another thread, but this one is the OPs mod of teh CS Java software, cool hey! I had tried to use a triac based clipsal light dimmer for better manual temperature for my GeneCafe but it kept tripping the Gene fuse. There are quite a few Clipsal light dimmers and some are for inductive and some for capacitive loads and*think I used the wrong one so I gave up. I started a few weeks ago to write a Python gui using Qt for my roaster as Im using the older serial DMM. It would have also forced me to learn learn Qt4 over Tkinker :-) I like your Python program. Nice work to all of you on that circuit. I have a good mate whos an electronics engineer and could help me build one. Im deciding whether to go your route or the Aurduino route - yours looks quite and elegant solution. I confess, I cant read the code [NFI] but I understand the electronics and have thought alot about this kind of control solution myself. How does the HG behave under reduced cycle [eg 80%]? ie Do you notice a different sound, fan speed etc. As your controller is not On/Off it should resolve that problem. 1. Is the PIDs set point effectively "tracking" in accordance with the tabulated profile? 2. Do you increase the sampling/calculation resoultion in the time between FC & SC...It strikes me that this will be the most critical and hardest to control period [due to the exothermic reaction]? How repeatable is a profile for a different bean mass or a different bean type [not that you would use the same profile for different beans]? Can you post some actual roast profiles? Temp control of an HG element will be pretty fast due to the low thermal mass, do you think your system will work with a higher thermal mass such as a Turbo Oven element? If it will work, using this controller in a "closed" system ala SCTO/KKTO would be about the perfect roasting solution. As your *controller is not On/Off it should *resolve that problem. 1. Is the PIDs set point effectively "tracking" *in accordance with the tabulated profile? I have put a PID on my Coretto. But unlike Andrews contraption the PID controls a SSR. The SSR then switches the HG and the BM element. The lag time on the element is about 30-60 seconds before I see a change in temperature gradient. After a lot of roasts I find that I use the PID in a different way to I intended. I control the ramp to first crack manually, with the ability to switch the BM element off/on and the HG off/low/high. The most common way I roast is to leave the element on and the HG low all the way to FC. If the roast is running slow I put the HG high for a few moments every 30 secs. Running too fast I use the PID to then slow the roast down. The PID is then used to control between FC and SC. This where it is really, really useful. I can sit almost anywhere between FC and SC for however long I like. The PID can also be used for "experimenting". I can run the roast quickly to a high temp before FC and use the PID to hold the temp so it doesnt run into FC too early. It aint perfect. It does over run but you learn how much it over runs, where and when to set it. So I basically use it more like a brake. It allows me to control the roast more easily. It also picks up temperature changes before I can, more importantly the rate of temp change, very usefully to stop runaways. I like the PID "brake" approach you describe and would be interested to hear more. eg Is the Lag occuring because of the element [have you tried just the HG]? really just a big resistor). for around $60 or $70. into the PIC (Ill put that one the website soon). to ensure the triac stays happy over the full power range. depend on the model of HG. that with normal PID control you get oscillation. roast (in blue) and a simulated run (in red). PID control code (well, not strictly "PID", but a variant on the theme). real roast and see if it matches what the simulator produces. to try to match the characteristics of your roaster. based on PyQwt *(which works on windows). 2. Do you increase the sampling/calculation resoultion in the time between first crack & SC...It strikes me that this will be the most critical and hardest to control period [due to the exothermic reaction]? I neglected to answer all your Qs in the first reply. Do you notice a different sound, fan speed etc. is just the fan changing speed. for a flat profile at a fixed temperature. target) as the input to the control code. smoothed version of the DMM temperature output. on the resulting temperature profile. 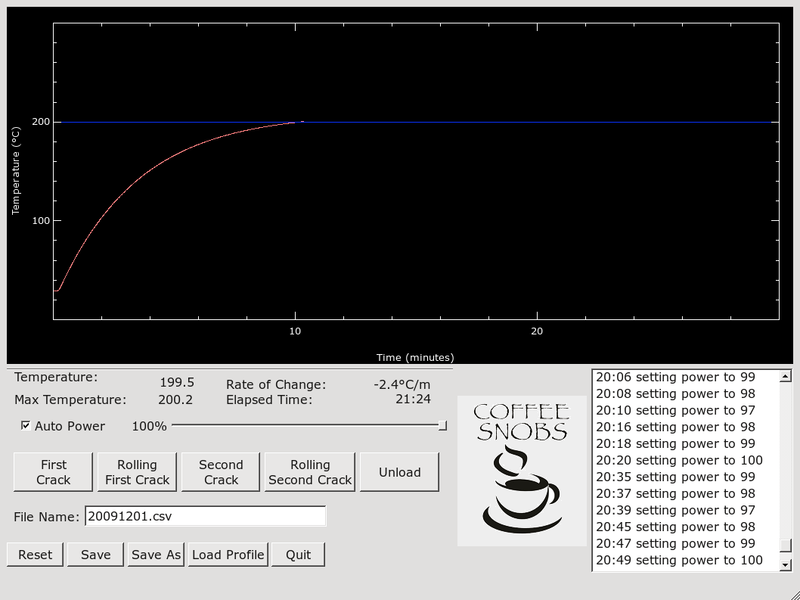 parameters to match the roaster. waveform at higher power levels when we looked at it with a CRO. you wait to turn it on when there is enough power. all power levels, and Im getting more stable roast profiles. the power control code still needs more work. is not a circuit for amateurs. Thanks for keeping us posted on your experiments Tridge. It looks to be a great system and I am looking forward to the next update. Perhaps you know already but it is really easy to add multiple thermocouple channels directly to a PIC using the Max6675 chips. Perhaps a monitor of the heater output temperature or ambient might be useful ? Always fun to have more numbers to play with. See http://coffeesnobs.com.au/YaBB.pl?num=1263085051 for the details. Have you considered cracking open the HG and hacking it to control the fan and heating element separately? This could help with the overheating issue you described - keep the fan at a relatively high speed, while lowering the temperature of the heating element. 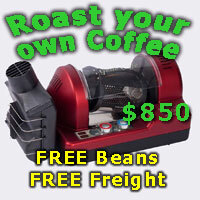 Although maybe this would put too much cool air over the beans? Now ya have to move on the the Turbo oven! Just a heads up for those interested in the nexus of coffee and Linux. Andrew Tridgell will be speaking as usual at the Linux Conference this week but this time it will be about using "Penguin powered coffee!" Shame my wife and I are missing the Linux Conf this year. Its in Brisbane and hopefully all will go very well for the organisers and the attendees. Just saw the video, very cool. Has there been any more development on this? Thank you Tridge for your work on pyRoast. I have used a modified (hacked!) 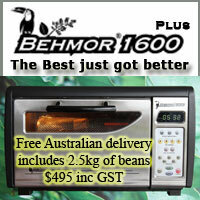 version to control a 'KKTO-like' roaster. I used a USB thermocouple and a USB relay (which operates a second 240V relay) to control the heat. It's only on-off... or 0 / 100% power. But it works. 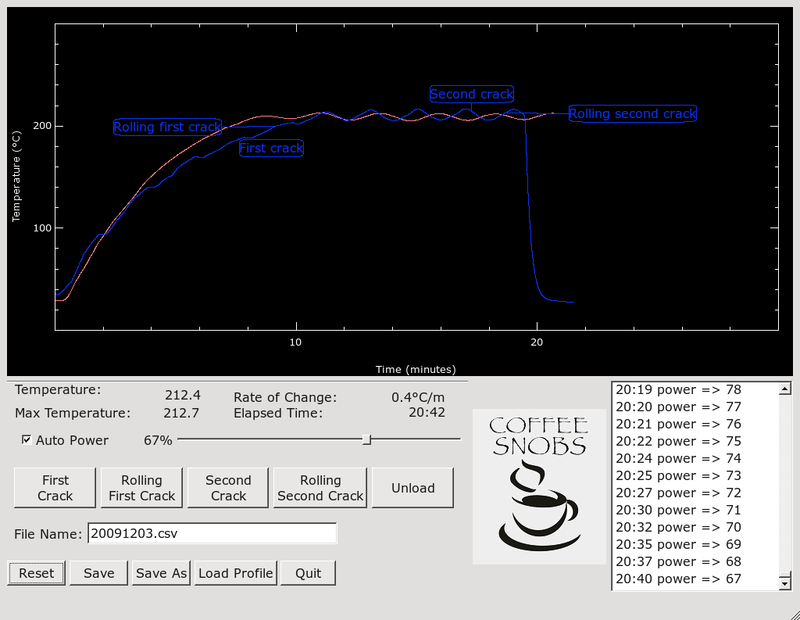 This afternoon it succesfully followed a roast profile (that I had to make up based on a previous roast). Next step is to have it roast without a profile but with an estimated first crack temp (eg full heat till say 30 degrees below estimated first crack temp, then slow the temperature change... till say 2 degrees below estimated first crack temp then slow the temp change more till say 10 degrees above estimated first crack.... then maybe sound an alarm to say it's time to turn it off? I took a screen shot (which will show that I still have some 'tweaking' to do) but I don't know how to load the photo to this post without using a URL? red is the actual roast.